She’s the kind of CEO who brakes for salamanders, has bottle-fed rescued squirrels and spent her vacation building furniture for a rural school in Costa Rica. She believes in the future and in the people who will build it. After weathering hurricane Katrina and losing her teaching job at Tulane because of flooding, she did what any social entrepreneur would do — start a company to save the planet. But it was her deep passion for Vermont’s furniture industry and sustainable forestry that fueled her often challenging rise to success. Now Peggy is the Founder & Chief Executive Believer at Vermont Woods Studios where she’s grown the company exponentially towards fulfilling their mission of raising environmental awareness. We sat down with her in this exclusive interview to find out why you should buy green furniture and what it takes to get a real social business off the ground. Conscious Connection: What inspired you to start Vermont Woods Studios? Peggy Farabaugh: The Siberian tiger. I was raised by parents who loved animals, especially wildlife. I remember we used to watch Mutual of Omaha’s Wild Kingdom with Marlin Perkins every Sunday night. I’ve always wanted to work with tigers and other wild animals or at least do something to help conserve them. About 20 years ago I started learning about endangered species by becoming a member of the World Wildlife fund. Their literature made me aware that all the big cat species (lions, tigers, leopards, jaguars, and more) are critically endangered. All the big ape species are critically endangered (chimps, gorillas, orangutans and more). All sea turtles are endangered. And the list goes on. A common thread in this problem is habitat loss (most notably forest destruction) and for many years I was consumed trying to think of a way that I, being just one person, could make a difference. Oddly enough the answer came to me after Hurricane Katrina, one of our country’s deadliest and most destructive storms blew through the South in August of 2005. I had been developing and teaching an Environmental Safety and Health distance learning program for Tulane University in New Orleans at the time and I lost my job when the whole university shut down due to flooding. I had to find new work. I was approaching my 50th birthday and I felt that if I was ever going to do something to help change the world, this was the time to go for it. I wan’t getting any younger. So I decided to start a company that would be driven by a mission to save endangered species by conserving their habitats. My first attempt was “Kids Saving the Planet” a non-profit environmental education initiative to support rainforest conservation (did you know that half of the world’s species live in the rainforest even though rain forests occupy only 2% of the planet’s surface?). But I wasn’t able to raise the money I needed to get Kids Saving the Planet off the ground. My husband Ken helped me come up with a plan for a for-profit company. Vermont Woods Studios was born as a way to promote forest conservation by raising awareness about where your furniture and flooring come from. I felt we could use the beautiful, sustainably handcrafted furniture Vermont artisans were making to raise awareness about where furniture comes from. We would focus on persuading people to purchase furniture and flooring made from sustainably harvested North American wood– not rainforest wood that was clear-cut from endangered wildlife habitats. We would help people see how their choice of furniture can save endangered species like the tiger. We would help them see that one person can help change the world. Conscious Connection: Tell me more about your company’s commitment to the triple bottom line. People: We have commitments to the people who work in our office, the craftspeople who build our furniture, the people in our local community, the people who power national and global conservation groups like the World Wildlife Fund and of course the people who are our customers. To all of these people we offer our passion, our hard work and our commitment to be part of a mutually beneficial partnership. Planet: I think it’s probably fair to say that, these days, every furniture store is advertising it’s “gone green”. But at Vermont Woods Studios we like to recall that we were “born green” with a mission of forest conservation from the start. In fact, Vermont’s been know for it’s eco-friendly furniture for over a century. 30 years ago when all the big furniture companies in North Carolina and the midwest (like Bassett, Broyhill, Lane, LazyBoy, Thomasville) were moving their manufacturing operations to China, Vermont’s furniture companies were staying right here in the Green Mountain State. They continued to make high quality American made furniture, remaining true to their communities and their local economies. Profit: I started Vermont Woods Studios with a passion for wildlife and forest conservation but I knew next to nothing about how to run a business. My husband, Ken is a good financial manager but he has a second (full time) job. So after losing money for a couple years we wised up and hired Douglas Fletcher, a former banker to be our business manager. Douglas likes to say that he looks after “the other green” part of the business and lucky for us– he does a great job at it. Conscious Connection: Why is it important to use products made with wood that is sustainably sourced in the US? Peggy Farabaugh: American forests are managed sustainably according to federal, state and local regulations. At Vermont Woods Studios we source our wood in Vermont when practicable although we will reach out to neighboring states when we can’t find what we need here in Vermont. Local sourcing helps our local economy and provides jobs and a better quality of life for Vermonters. Alternatively, sourcing wood or furniture from overseas means supporting a system where corruption and organized crime are well documented. Illegal logging in Indonesia, the Russian Far East, Burma, the Amazon, and the Congo Basin is rampant causing rainforests and their inhabitants (both animals and indigenous peoples) to be systematically destroyed. Conscious Connection: Vermont is known for a rich history of furniture craftsmen — can you tell us more about this? 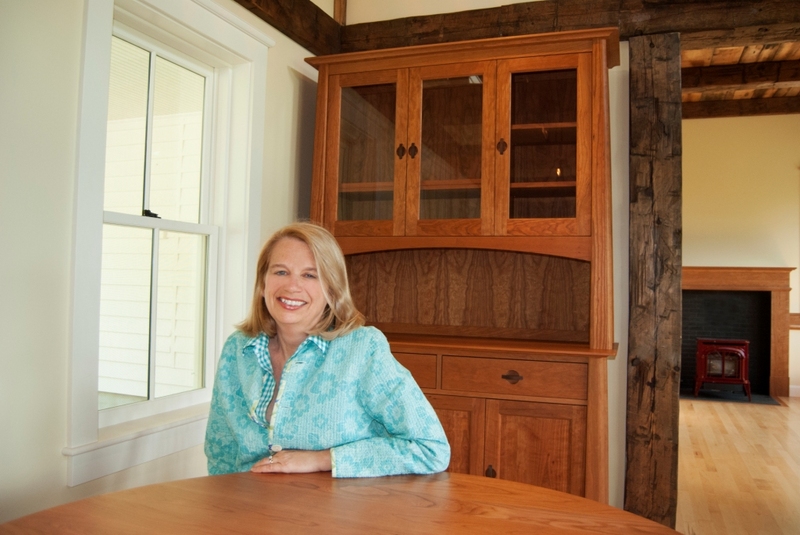 Peggy Farabaugh: Vermont furniture making history can be traced back to the 17th century, and by the 18th century almost every town in Vermont had woodworkers making furniture, tools and utensils. Wood products became the single most important manufacturing industry in Vermont during the 19th century. It was then that Vermont-made, quality wood products began their long history of export to customers all over the U.S. and abroad. Today Vermont furniture makers are still known for their dedication to quality and authenticity. The Green Mountain State is home to over 1000 furniture companies plus nearly 2000 independent woodworkers operating out of small shops, barns and garages. Vermont ranks #1 in furniture makers per capita. Together they have earned a world-wide reputation for innovative, natural styles and green design. Conscious Connection: What was the biggest challenge you had to overcome to get Vermont Woods Studios to where it is today? Peggy Farabaugh: It’s always been challenging trying to persuade people to believe in us and in our mission. Eight years ago the idea of selling handcrafted furniture online sounded ridiculous to most people. “Fine furniture is a product that has to be seen and touched and sat on. It would be impossible to sell it online.” That’s still true for many customers. But not all. Personally I prefer to research products independent of a salesperson and I often use the Internet to do that. I felt there were enough others like me to create a market for us and that’s proved true. The other big challenge we’ve had is finding people to help build and grow the company. I’d guess this is true for any small business. Besides finding smart people who believe in our mission, we need staff who are willing to live with all the craziness and ambiguity that go with creating a new way of doing business. We’ve been lucky to find extraordinary staff members and we’re so grateful to them for the work they are doing. Conscious Connection: Any final advice for other aspiring social entrepreneurs looking to make a difference in the world? Peggy Farabaugh: Selling furniture (or anything else) on the Internet is extremely competitive and you have to adapt to a dynamic environment where technology is always changing. Customers shop online because it’s the place to find exactly what they want and companies must continuously improve their technology to serve that purpose. People are going to search through all your competitors’ websites (and hopefully your own) to find great design as well as the best quality, the most responsive and friendly customer service, the lowest price and best overall value. When I first started Vermont Woods Studios I thought we would find customers just because we were selling eco friendly furniture. It took awhile to understand that, although sustainability is a priority for our customers, it’s just one of many essentials for a great piece of furniture. My only advice is to define your niche as one that you love and one that you can eventually accomplish better than anyone else in the market place.